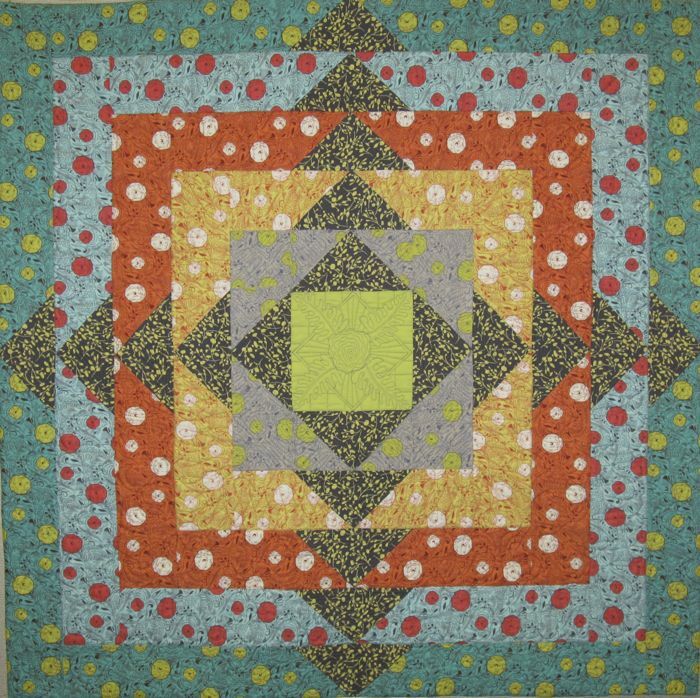 Posted on October 1, 2013 by Elizabeth E.
I finished my quilt, and I’ve titled it Juxtaposition. Every quilt teaches me something, and this one taught me to try again, to not get discouraged, to discover new ways of doing things. 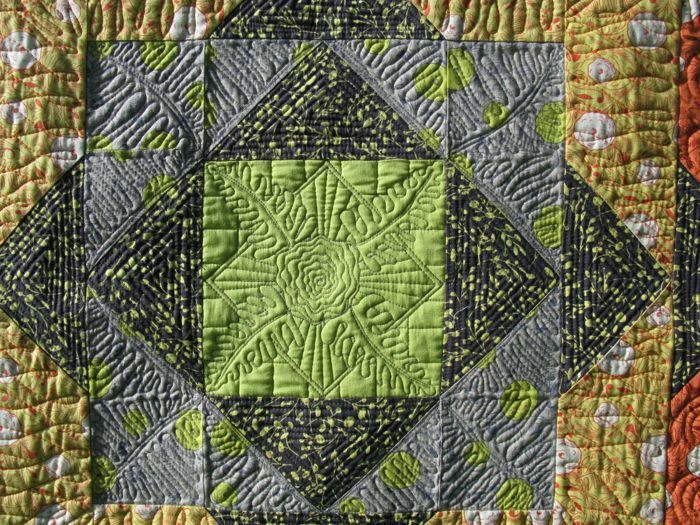 This photo of the quilt, shows less of the texture–the quilting–and more of the color and pattern. I love the pattern. 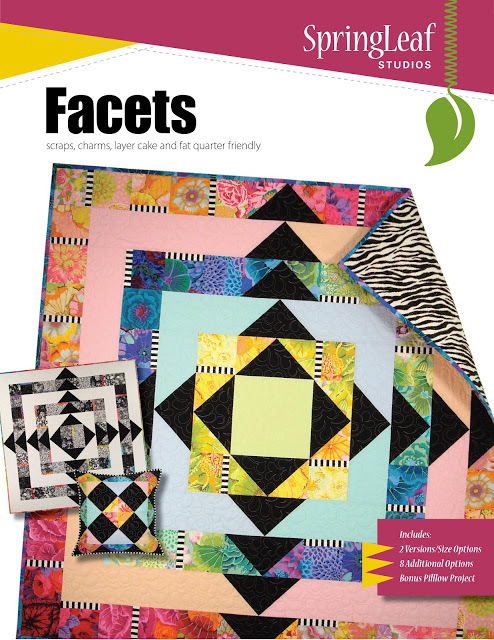 It is Facets, from Anne of SpringLeaf Studios and as a lovely part of this quilt, she will be offering one pattern for a giveaway. (See the end of this post.) I only did one of the several versions of this pattern; mine was the simplest, but all of her directions are clearly written and easy-to-follow. The easy punch of the graphic design drew me to this, and I knew that the fabric I chose, Charleston Farmhouse, would be a perfect fit. I just didn’t anticipate the difficulty of quilting that central square, but it didn’t take away my fondness for this pattern. 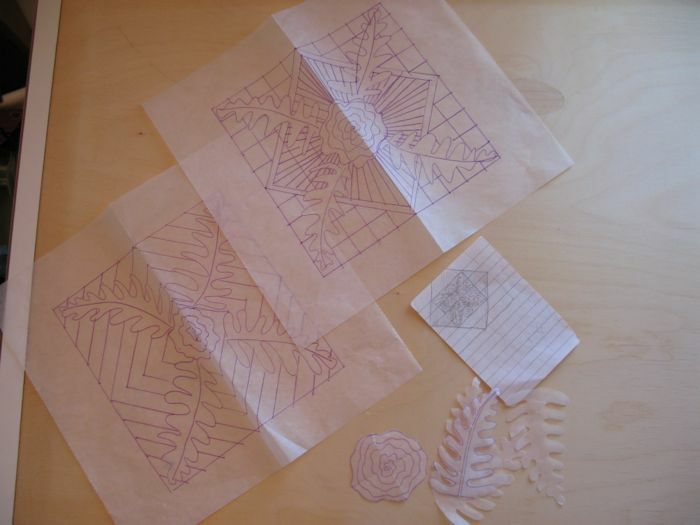 I’m already planning to make it again, using the blocks idea shown on the front of the pattern. 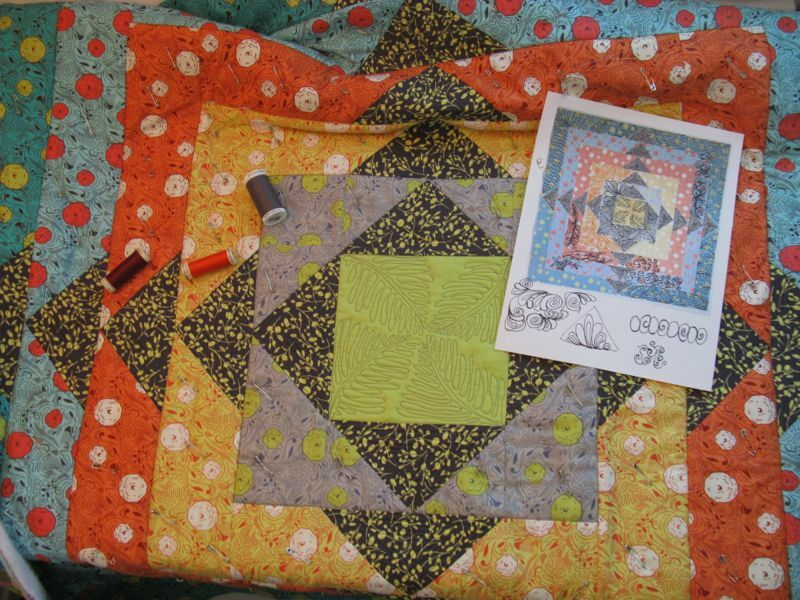 I wrote about the frustration I experienced in quilting this, but sitting in my hotel room one morning (we were away at a conference), I realized that if I didn’t tackle and finish, this quilt, I probably would pitch it in the thrift store bag. So I drew up two ideas for the center; both were generated by a comment of a reader who said that my ferns in my original design were facing the wrong direction. I thought a long time about what she said, and as I drew, took in her ideas. I let my husband and my quilter friend Beth vote on the one they liked, and I went to town. 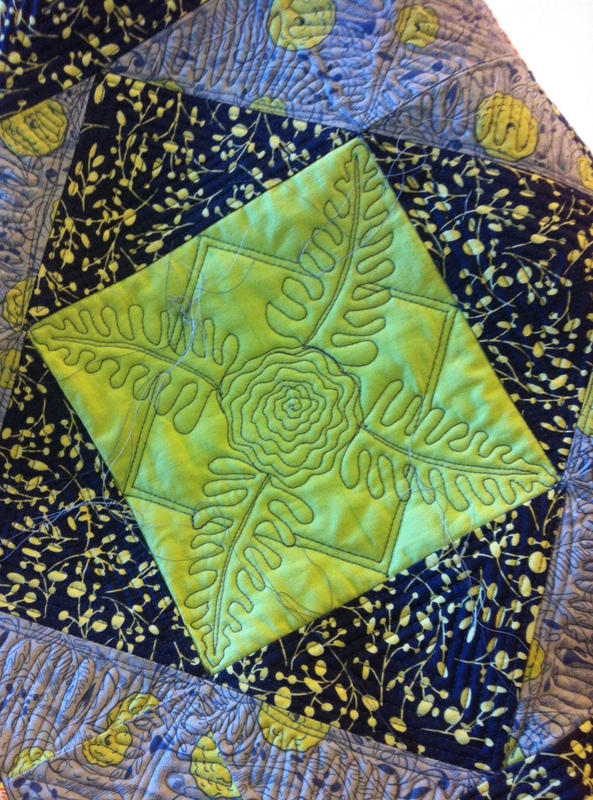 I used a blue marking pen to assist me, but didn’t trace the leaves, as I still wanted that organic look to the quilting. After I finished, I had my quilt in one hand, camera in the other, walking around the hotel looking for places to take its picture. 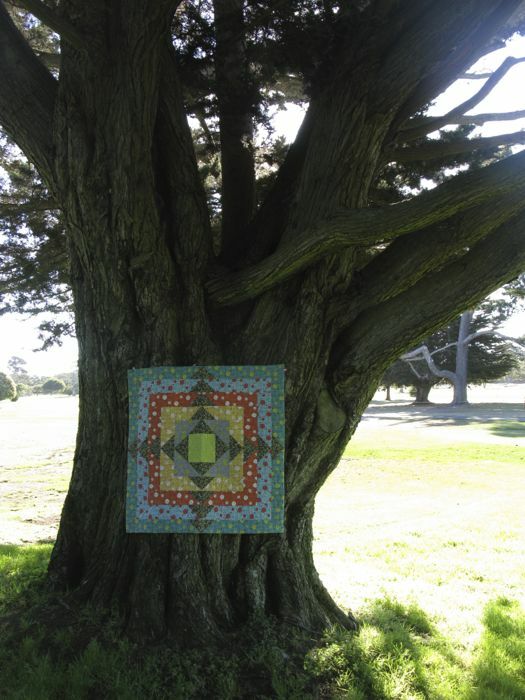 This shot was taken in full sun, laying on the grass in the late afternoon and the texture of the quilting really pops. 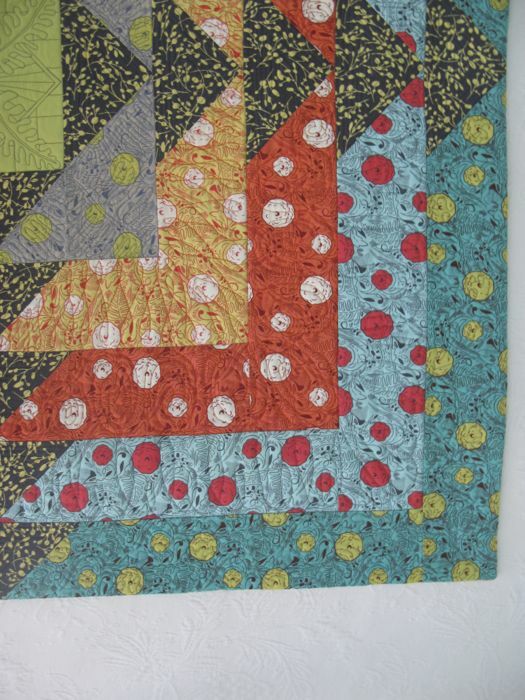 I used a faced binding again on this quilt, and I like how it looks. It was lovely to come home with a finished quilt. This is quilt #121 on my 200 Quilts List. It is also part of the Third Quarter Finish-A-Long, and I’m happy to say I finished one more quilt on my list! 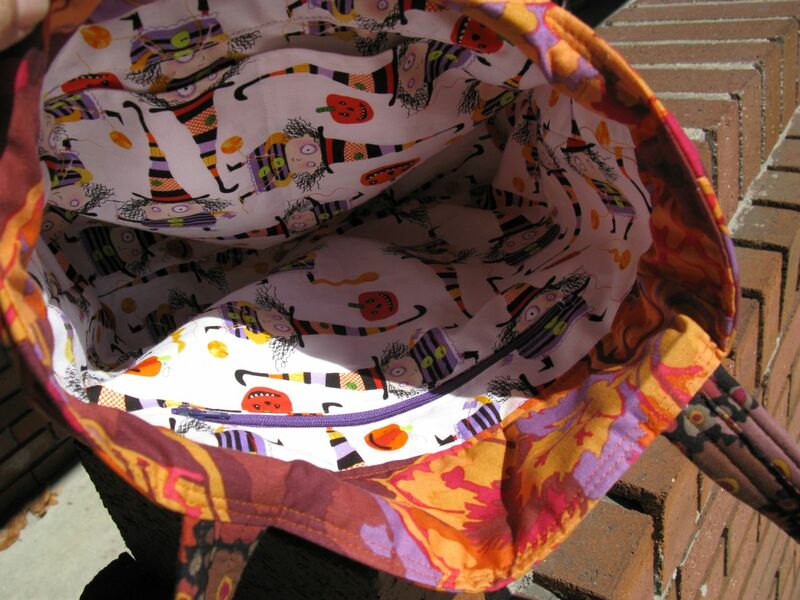 And also today, my tutorial on Y-seams posted at Leanne’s blog here, if you need a little help in that direction. To win a copy of this pattern (it’s a downloadable PDF), tell me about the hardest quilt you ever made, that really challenged you, but one that stuck with until the end. Are you glad you finished it? Do you hate the quilt? Love it for what it taught you? Gave it away as soon as you could? Leave a comment and I’ll pick a winner on Thursday evening. 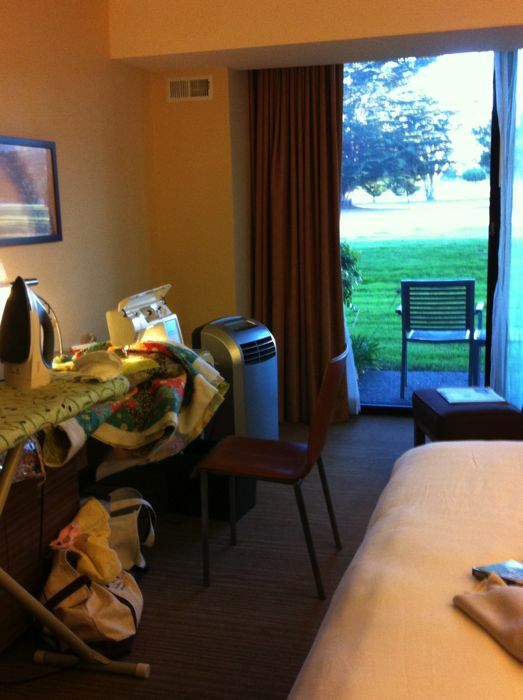 Posted on September 25, 2013 by Elizabeth E.
This week I spent holed up in hotel room, sewing on fun things left and right. And some not so fun things, that turned out to be fun things, once they turned out. 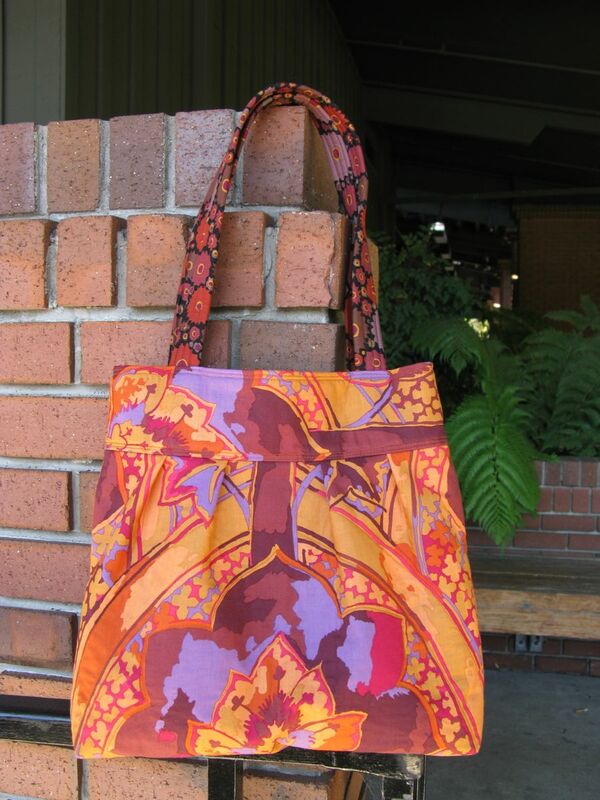 The Autumn Tote (above) is one of the fun things that turned out quickly. It was my second time making this pattern, and I was able to use what I’d learned last time and make the needed tweaks to the pattern so it turned out much faster in the sewing time. This is the class sample for the class I’ll be teaching on October 22, Tuesday evening from 6-8:30 p.m., if you are in the area. 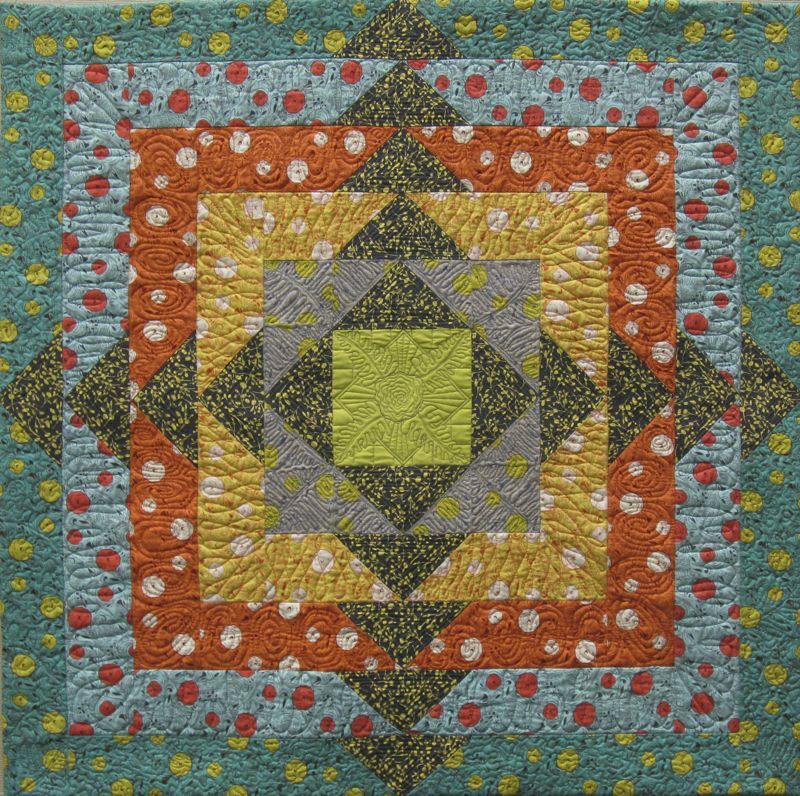 I’ll be teaching it at Bluebird Quilts in Grand Terrace, California (phone number is 909-514-0333). I love the rich tones of autumn in this piece. This tote is big enough that I can get my iPad in here with no problem. If you decide to make it, pick something fun and whimsical for the interiors! Full reveal comes in a future post, but finally! I was able to move this quilt from Problem Child to Model Student. It all came because of a comment on my post from Linda, who noted that besides all the other things I mentioned, the ferns were headed in the wrong direction. A redraw, and a few other tricks which I’ll mention later, and I was on my way. Here it is in an interim step, threads hanging out and everything! 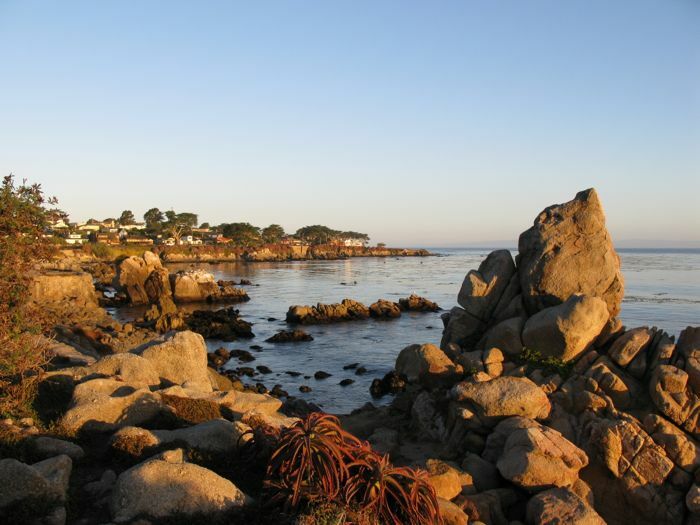 Tomorrow we leave from home after one last walk along the beach here in Pacific Grove (California), watching the colors on the rocks change as the sun rises. It’s been a lovely time.